This is one seriously cool car. The styling is both familiar and out-of-this-world. I say “familiar” because from certain angles (especially overhead) there is a distinct Mercedes-Benz 300SL look about it. I don’t think I need to explain the “out-of-this-world” part. Let’s talk about this design. It was penned by Giovanni Savonuzzi, the technical director at Ghia at the time. He based it on a one-off 8V race car that was used in the Mille Miglia. This was the first (of 15) Supersonics built. The space-age name is certainly appropriate with these looks. Because it was the first of the series, this car has certain elements that differ from the cars that followed. The engine is the basic 8V engine – a 2.0-liter V-8 making 110 horsepower. 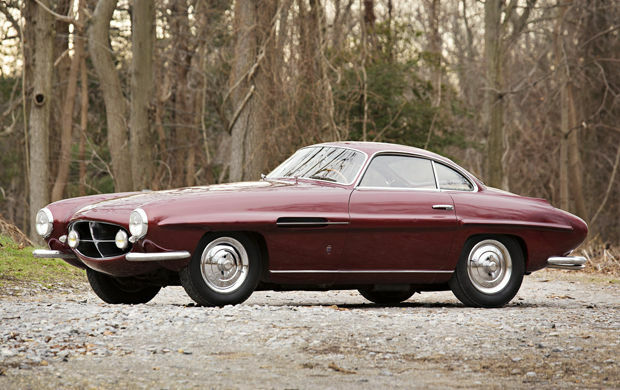 This car stayed in Europe for a little while after being constructed at Ghia’s factory in Turin, but it eventually ended up in the hands of its first owner in the U.S. In 1955 it changed hands – being bought by Paul Lazaros, who used the car briefly before putting it in storage where it remained for over 55 years. He sold it at a Gooding auction in 2011. The car is entirely original, winning the Post-War Preservation Class at the 2011 Pebble Beach Concours. This is not a car that has been shown extensively – in fact, it has rarely seen the light of day in the past 50 years. The current owner has had it for two years and it’s time to find it a new home. That home could be yours if you’re willing to part with between $1,300,000-$1,700,000. Click here for more info and here for more from Gooding in Florida. This entry was posted in Uncategorized and tagged 1953, 8v, auctions, cars, classic cars, fiat, ghia, gooding & co, supersonic by classiccarweekly. Bookmark the permalink.